Rebellion have collected Future Shocks from the pages of 2000 AD into this first volume – out this week! Alan Moore, Grant Morrison, Peter Milligan – if you recognise these names as some of the giants of the comic book industry then you have a certain 2000 AD series to thank! The legendary Future Shocks launched some of the industry’s biggest names and its hundreds of mind-bending stories are now all being collected together for the very first time. This exciting first volume takes us back to the earliest days of the strip – painstakingly restored by Rebellion Publishing’s skilled reprographics team, these pieces of sci-fi history are collected together in a thick, satisfying paperback. Tharg’s Future Shocks are one-off, twist ending, sci-fi thrills that have introduced many of the biggest names in the comic book industry through the pages of 2000 AD. 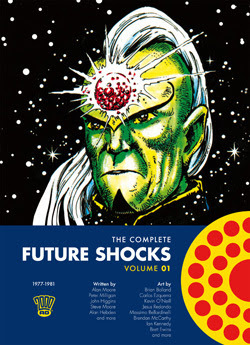 From Alan Moore to Al Ewing, Kevin O’Neill to Jon Davis-Hunt, Future Shocks have been a staple of the UK’s best-selling comic 2000 AD! This exciting first volume takes us back to the earliest days of the strip and showcases the burgeoning, immense talents of such luminaries as Steve Moore, Alan Moore, Brett Ewins, Brian Bolland, Dave Gibbons, John Cooper, Carlos Pino, Jesus Redondo, Steve Dillon, Peter Milligan and many, many more.